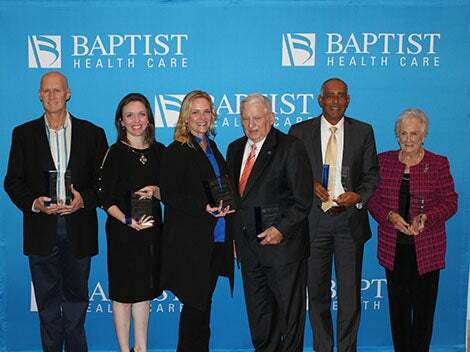 PENSACOLA, Fla. (Nov. 12, 2018) – The Baptist Health Care Foundation announces the 2018 Hollinger Award recipients for outstanding service contributions to Baptist Health Care. The awards are presented to individuals, families or organizations that have exhibited exceptional generosity and community leadership through gifts of their time and/or financial support. The award is named in memory of long-time supporters of Baptist Health Care, Pick and Alberta Hollinger. The couple worked tirelessly to improve the quality of life for those served by Baptist. The 2018 recipients were recognized at the Baptist Health Care Foundation annual meeting on November 8 at the Pensacola Yacht Club. Lifetime Achievement: Fred Donovan, Sr.
Editor’s note: Those pictured, left to right, are: Dr. Charles Roth; Kara Elliott-Jordan; Tara Rollins; Fred Donovan, Sr.; Dr. David Josephs; Marjorie Stone. For more information about this press release or to schedule an interview, please 850.791.5254 or BHCMediaRelations@bhcpns.org.